Writing with Scrivener changed my life. Well, it changed my writing life. My writing process, whether for myself or clients, had multiple steps, stages and programs. For example, I would use OneNote for my research, but sometimes I’d write there too. Primarily, I’d write in Microsoft Word. Sometimes I’d use Google Docs instead if I was on my Chromebook, or Notes if I was on my iPad. You get the idea. I was kinda all over the place. If I worked on a longer document, like a white paper, I’d be scrolling up and down checking my structure and headings. When I wanted to move things around, I’d need to cut and paste large sections. If you’ve ever created large or complex documents in Word, you know how awful the result could be. I’d heard how writing with Scrivener could improve productivity. Still, I stuck with what I knew. Once I committed myself to publishing my fiction though, I made the leap. And I’ll never go back. Here are the top five reasons why. 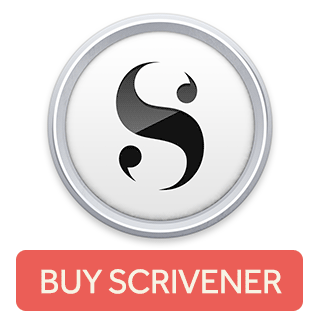 Scrivener makes it super easy to organize your writing. Every project has a binder that contains all your content in one place. Adding new chapters or sections is as easy as clicking a button. In the templates that come with it, there are folders for research, “front matter”, characters and settings. You literally can do, or store, everything in one program. Forget switching around, copying and pasting between programs. I think I actually giggled out loud when I figured out how to add labels and statuses like “To Do” and “First Draft” to my writing. For once I could see where I was, how much I had left to do, and what I still needed to research. I felt empowered. Suddenly going from overwhelmed to knowing exactly what needs to be done would make you giggle too. Or at least smile if you’re the stoic type. Add to this the fact you can add color to show those labels and you might just get up and dance. I’m pretty sure I did a little jig. Just a little. These features work a little differently depending on what platform you’re using. I go between Windows and iOS, but I love how it works in both. ￼The corkboard lets me see my project on one page. It uses an index card image to represent the chapters or sections depending on the part of the project I’m viewing. In this image I’m looking at the chapters in the Outpost section. The cards have the colored label indicator I mentioned above (the green flag on the upper right corner) and the current status “stamped” on the card. You can see the synopsis for each of the chapters too, so you know exactly what each one is about (except I made these vague intentionally. I don’t want to give too much away!). Need to swap chapter 12 for 15? Drag and drop them where you want them. No cutting and pasting. And no permanently destroying the formatting of your document (I’m flashing back to my Word days now). Full-screen mode frees me to write and do nothing else. Yes, other programs have it. I’ve tried them, and generally only used them once or twice before getting annoyed with them. But Scrivener does it right. It’s a simple thing, but when I enter full-screen mode, I feel a sense of freedom and distractions actually disappear. It’s me and my keyboard. And that’s all I need—but if I need more (like changing a font or inserting a comment) I can get to it easily. On the iPad, the important stuff is inconspicuously hiding at the bottom of the screen, but you can remove it if you want. On the desktop, with the wallpaper I have (shown in the image), it simply makes me happy. There’s no other way to say it. I see the ocean in the background and a page to write on in front of me. It is my happy place. One thing that has helped me write more efficiently is giving myself goals. This is really important in something like NaNoWriMo, or any project you want done by a certain time. For a while, even with Scrivener I was manually adding up the words I was writing. I’d jump between chapters and have to remember to write down the numbers before and after I started each one. But then, I found out about goal trackers. You can enter a goal for the entire project or a session goal. The first one is obvious. The second means it will count the number of words you write, wherever you write them, during that session. Then a colorful status bar (or circle on iPad) shows how close you are to meeting the target. It’s silly, but I love making that bar turn green when I meet my goal! There’s so much more to writing with Scrivener than these five things, but they are my favorite ones. So far. And the images here are a mishmash of my current projects. Some are from my Windows desktop, others from my iPad. And I guess that leads into a bonus sixth favorite thing: syncing with Dropbox. It doesn’t matter what device I use, my projects always stay up to date as long as I have an Internet connection. I don’t even have to think about it most of the time except on the rare occasion I close up my iPad without letting it sync. If you’ve heard about it, but haven’t tried it yet, go download it now. You get a free 30-day trial so there’s nothing to lose. My only advice is to make time to follow the tutorial. It took me about two hours, but without it I would know less than half the things I do about writing with Scrivener.